The moderate size of Weimaraner dogs makes them a great addition to families of all different sizes. This hunting dog breed generally has a silvery-gray coat that is quite distinctive and definitely showcases its speed. Extremely smart and very friendly, these dogs are graceful and are great with children. They’re also eager to please and can be trained very easily. You won’t find a Weimaraner backing down from learning something new because they’re very can-do animals. It’s important that you keep them up and active, however, and also that you keep their minds going because these dogs prefer the agility in all areas. Considered a sporting dog, this gun dog breedis extremely obedient and loves to spend time with their owners. Great for hunters and for your average family, they’re practically fearless and beautiful dogs. Generally healthy, a Weimaraner requires approximately 2 ½–3 ½ cups of dry food each day, though the exact amount will vary based on size, activity level, and metabolism. These are usually spread over 2 meals. If your dog is spending a lot of time running around outdoors, they’ll definitely need more food than one that sits in the house all day. 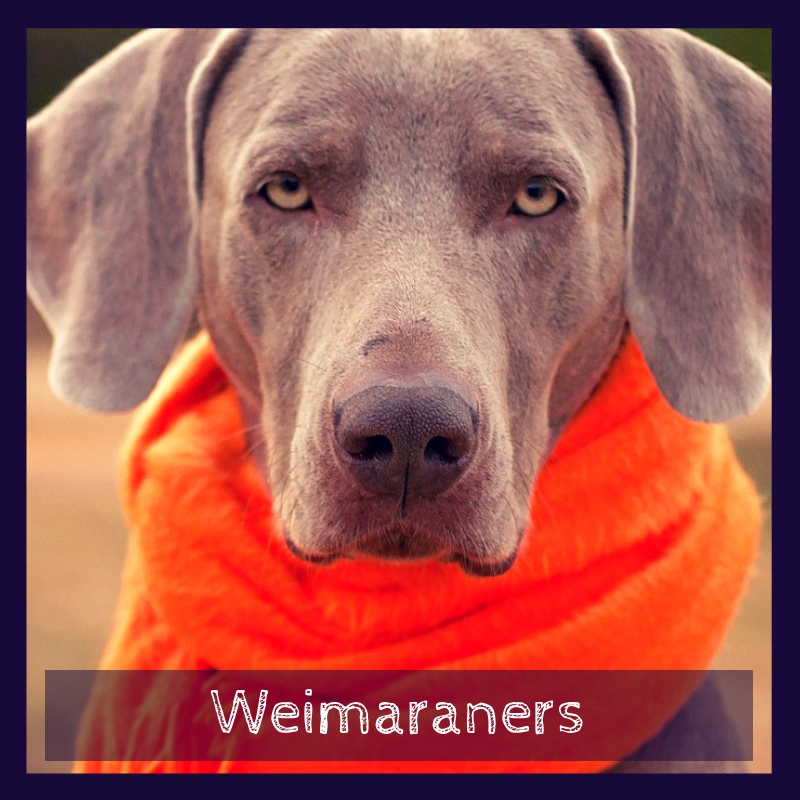 Just make sure you’re getting a quality food that will keep your Weimaraner looking their best. This hunting dog breed should actually be quite thin and you can tell if they’re gaining too much weight by looking at the waist and feeling for the ribs. You should be able to see their waist by looking down their body. You also should be able to feel their ribs by setting your hands on each side of the spine and gently running your hands downward. The ribs shouldn’t be visible, but you should be able to feel them. The coat of a Weimaraner breed is very short and is usually solid in color, though it could range from a moderate gray to a true silvery color. You shouldn’t have much problem getting the grooming done well, as the short coat makes it easy for the dirt to come right off. A bristle brush weekly is a good way to complement the natural ability and to make sure that shedding is kept to a minimum. These dogs tend to really enjoy rolling around in mud and anything they can get into so a bath may need to be a frequent occurrence to keep them clean and smelling good. Wiping them down with a towel will also make the coat continue to shine. If you’re looking for dogs that can run and keep up with you then Weimaraner puppies are definitely the dogs for you. They’re highly active and love to run as much as possible. For those with a large backyard or plenty of time to spend at the dog park, this is a great dog that’s going to love getting outside just as much as you do. They want the mental and physical activity and will actually thrive with this. Weimaraners do best when they have at least a couple hours of exercise each day, which can include walking, running, hiking or playing fetch. Even hunting is a great pastime for them. It’s important to keep them safe, however, as they can be quite good as escape artists. Locks on the doors and care for fences and digging is also important. You’ll want to watch the Weimaraner puppies because they can get quite destructive and may have difficulty with housebreaking. 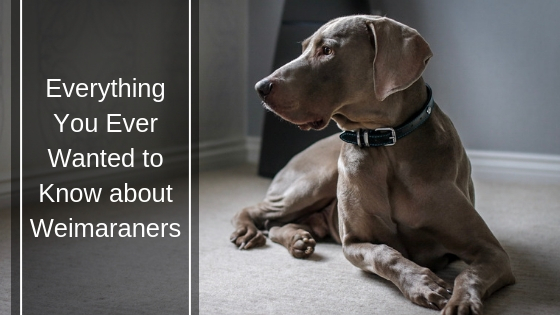 It’s also important to spend plenty of time with your Weimaraner as they may suffer from separation anxiety, which can cause additional destruction within the house. Can Weimaraners Be Easily Trained? 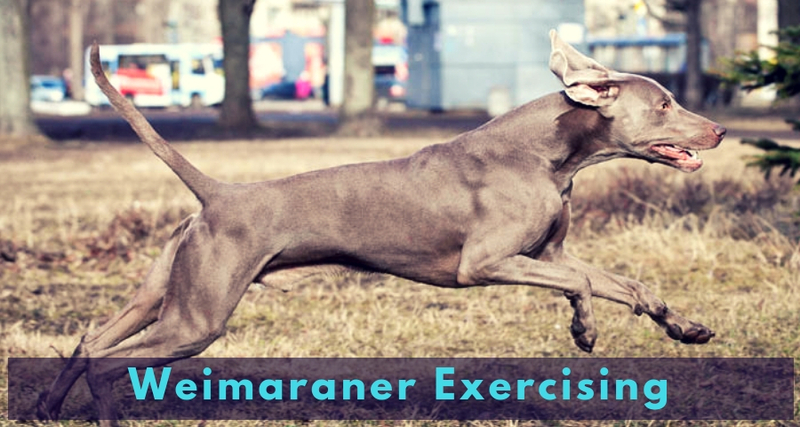 Training your Weimaraner may be difficult and the process can take a bit of work, but they are extremely intelligent dogs and will definitely learn plenty of new tricks. In fact, many can figure out how to open gates and doors and even turn faucets on and off. Keeping your training sessions as short as possible is important so they don’t get bored and making sure to praise positive behavior is another important factor. They can be trained, however, and getting them started as early on as possible is likely the best way to go for anyone looking to add one of these dogs to their household. Are Weimaraners Suitable ESA Canines? In general, the Weimaraner is not the most ideal canine to become an ESA. They can be quite large for this purpose and also need a lot of exercise as well as training in order to be fully happy. Because they also suffer from separation anxiety, they may struggle with being apart or even with getting overly excited when they are around you. These dogs are good for those who want to go hunting or those who have a lot of energy, but not for those who need emotional support who travel frequently. Making sure that you get health clearances for your Weimaraner puppy is an important step in making sure that they are healthy and ready to go. These are available from the Orthopedic Foundation for Animals and the Canine Eye Registry Foundation, especially if you are getting your dog from a reputable breeder. Overall, there are a number of great reasons why a Weimaraner might be the right dog for you. It’s a moderately sized dog and it’s highly active, which means it’s an amazing option for those with plenty of energy and time to run around and chase after them. They need very little care when it comes to grooming and is very smart as well. That means they can be a great pet, but you’re likely going to want to keep looking if your idea is to get an emotional support animal.